Andreas Gabalier, Franz Klammer, DJ Ötzi, Didier Cuche, Sebastian Vettel: personalities from the worlds of sport, business and showbiz are to run the gauntlet during a slalom event after the Downhill Race (Saturday, 23rd January). Organization of this giant slalom race is managed by none other than Formula One greats, Bernie Ecclestone and Niki Lauda. Last year, organizers were delighted to raise over € 150,000 in donations. The money is used to provide ongoing support to needy Tyrolean mountain farming families. Initiator and organizer of this charity event is the WWP Agency. The original idea for the event came from Burghard Hummel and Harti Weirather (WWP), with Tyrolean Formula One legend, Gerhard Berger. The goal was to create a side event in which celebrities could take part for a good cause – and so the KitzCharity Trophy was born. 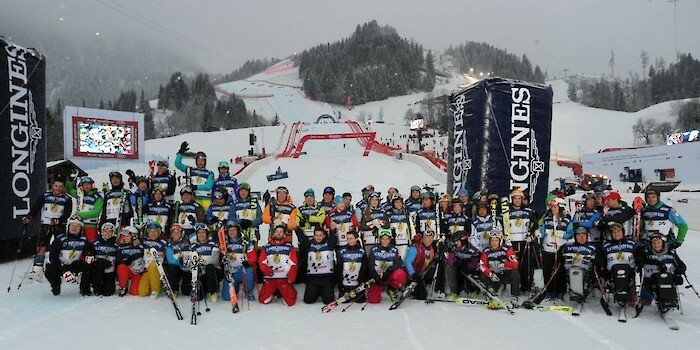 It has been an established part of the Hahnenkamm Weekend programme since 1997. The charity event has drummed up one and a half million Euros since its inception.